The Grimoire. The book of Shadows. The Book of Mirrors. The Spellbook. It’s hard to imagine a witch or magician without seeing them holding one of these. Every TV show or movie that has magic in it always has a shot of this amazing, ancient-looking tome of knowledge that can save or destroy the world, depending. The truth is, your own magick book (by whatever name) is the most important magick book you’ll ever read. Why Is My Own Magick Book More Important Than Another’s? Magick is a very personal practice. It is how you, as a witch/wizard/magician, relate to your experience in the material world. For many of us, it is an integral aspect of our spiritual life. Personally, I see magick as absolutely, 100% spiritual. At its highest expression, you can use it to transform yourself from the inside to be the best version of you and develop your relationship with your deities on a very personal level. Because of this highly personal nature of magick, your own records of your experiences are the most valuable magickal reading. My Book of Shadows made from a hard-cover sketchbook. The cover is made from Sculpey clay and glass gems and glued on. This is my art magick journal, where I transfer things from my other grimoires. I’m not saying that reading other sources is not important because it is. Those who have come before us have much to teach us, and there is a lot of good (and some not-so-good) information out there. And when you’re just starting out, you kind of have to use other people’s experiences and work as an example. But a magickal path is one where you take responsibility for your own understanding, ego, and relationships with others. At some point, that means teaching yourself from you own past experiences. There is this misconception that the older a spell or system is, the better or more legitimate it must be, but this isn’t the case. Truth has no age, and your own truth might have bits of ancient knowledge mixed with brand new realizations. Recording this for yourself will help you grow in your magick. Every new witch I’ve ever met, including myself, went out and bought a beautiful journal to use as a book of shadows, and then couldn’t ever put anything in it for fear of “messing it up.” There is nothing wrong with having a beautiful heirloom book where you record your most-used information and spells, but you should never be afraid of “messing up” your grimoire. Any mistake you make in it is part of your path. Part of the appeal of old journals is seeing where the author crossed things out or wrote updates and notes in the margins directing the reader to another page with new information. Even illuminated manuscripts, which inspire so many grimoires, have notes in the margins, drawings, and yes, even mistakes. A Book of Shadows is not just a pretty book, but an evolving record of growth and understanding. Molly Roberts made an excellent video called ROCK Your Grimoire! If you’re afraid to write in your book, go watch it now and come back. I’ll wait. I think it’s a great idea to have several magickal journals going. What you call them is up to you. 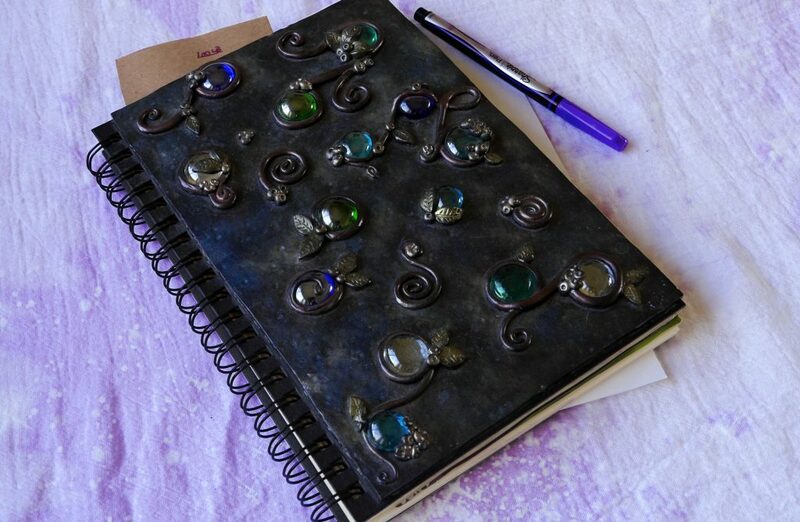 It takes the pressure off of having to make one “perfect.” I have a hard-cover sketchbook that I decorated with Sculpey clay and glass gems as my “art magick book.” When I feel creatively inspired, I’ll put information here and make it look as mystical as I want. There are collages, envelopes, flip-out pages, and all kinds of mixed materials. It gets cooler-looking every time I work in it, and it’s just fun! I call this my Book of Shadows. If I were to show someone my most impressive-looking magickal book, this would be it, but it isn’t where the real work happens. The Book of Mirrors is my “gritty” grimoire. This is where I record everything and work through things. 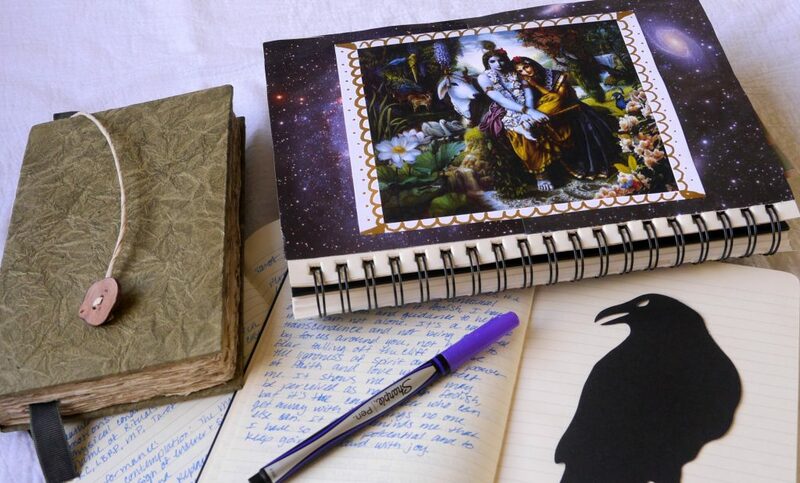 My Tarot Journal is meant specifically to record divination sessions and learn the cards. Both books are simple Moleskine journals. Which leads me to my Book of Mirrors. It’s just a Moleskine journal that doesn’t look very exciting, but it is way more useful than my Book of Shadows. This is my “Gritty Grimoire.” It’s where I record what I did for rituals, how I changed things, what questions I’m facing, what is working for me and what isn’t. This is where I really get into my practice, pick it apart, and put it back together. It’s messy, it’s organized only by page flags and bookmarks— if that— and there are random sigils shoved in between pages. This is where the actual magick happens. I don’t worry about how it looks, so I can be free to do whatever in it. This freedom to make all kinds of mistakes means I end up with entries that are actually really meaningful and I learn from them. Then I can transfer stuff to my Book of Shadows when I want. My third book is just my Tarot Journal. I try to keep this one strictly tarot, but I end up writing tarot stuff in my Book of Mirrors too. 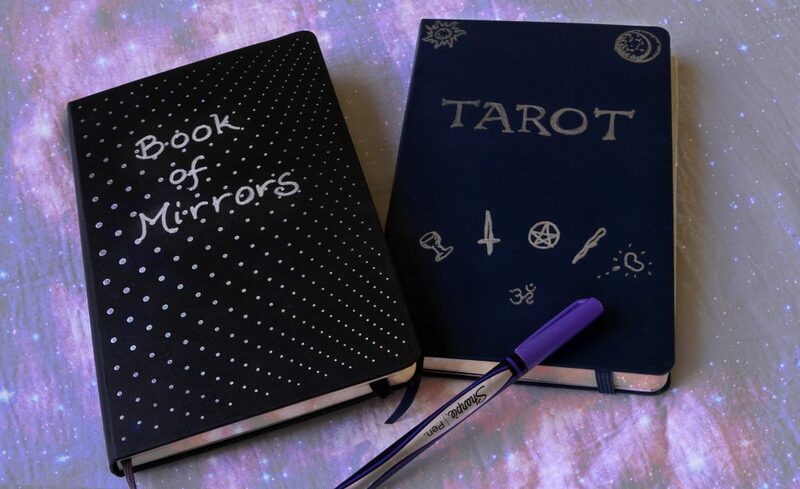 I mention my tarot journal in this post. If tarot isn’t your preferred method of divination, then maybe use a scrying journal. Or, maybe you keep all of your magickal workings and divinations in one book. It’s up to you. Here is a collection of various magickal journals I have in the works. 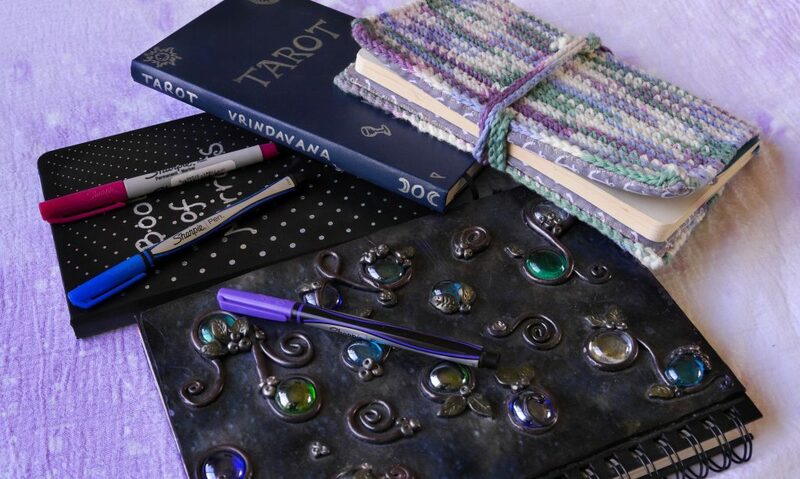 There’s a Moleskine soft-cover in a crochet journal cover that I made, two hard-cover journals, and my sketchbook Book of Shadows with all the shiny bits! You can even create a digital magick book if that’s better for you. Some people even use personal blogs as their grimoire. You don’t have to have a physical thing that you write in, but for me, the act of actually putting pen to paper in itself is highly magickal. Which do you prefer? You can set a goal to write every day, and if you’re SUPER disciplined, you might actually do it. I try to write every time I work at my altar, even if it’s just a few lines. This means I’m writing in it most days of the week. I don’t put pressure on myself to write every day because then it feels like a chore. Instead, I choose to write often, and I end up writing way more because of this. However, I do make sure I meditate every day, even if it’s just for a couple of minutes, whether I “feel like it” or not. 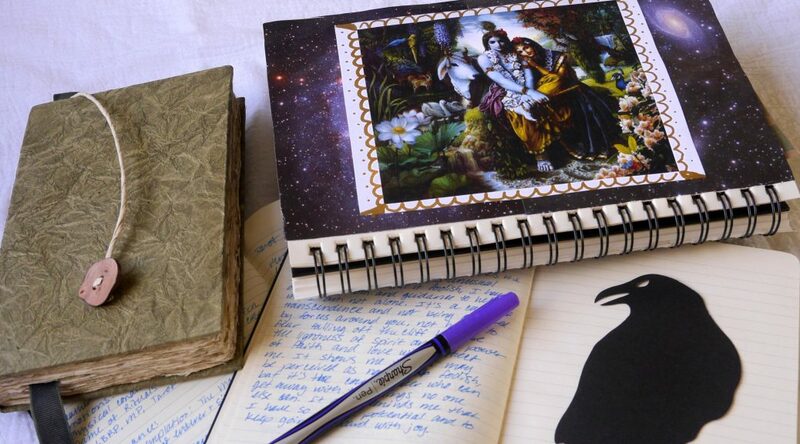 A magick journal is not just for spells and rituals. It’s a good idea to record any insights you receive from meditations, divinations, or prayers in your magick book, even if you just write one sentence or a list. You can keep notes from other books you’ve read. Write down the phase of the moon or the weather or seasons and how you’re feeling that day. Your mood is an important factor in magick. If you are struggling to feel connected, write that. If you’re trying new things, write what they are and whether they feel right to you. Shadow work reflections are definitely something you’ll want to record. You don’t even have to write. Doodle, or paint instead. Sometimes, we perform a ritual a certain way and then realize it just isn’t working anymore, because we’ve changed. Write down how you’ve changed and what you can do to update your ritual to reflect that. My practice now looks very different from when I started when I was 12 or 13. Even the things that have stayed with me, like casting a circle, have changed dramatically in how I actually do it. I look back on my notes frequently to see what I’ve learned. Remember, your magick book is your own, personal record of your magickal growth and development. This is your most valuable tool, where you record all you’ve learned and are learning. It isn’t something you’ll be presenting for other people to judge, so don’t be afraid to get messy and get really into it. That’s what it’s for! As for it “looking” like magick, the more you use it, the more it will look and feel like the grimoire of your dreams. Doodle in it, scratch things out, rewrite, and write over stuff. Just make it yours! This is the most useful, powerful, and best magick book you will ever read! How do you journal your magickal journey? Is it in a physical book, or electronically? Let me know in the comments!